Photo by flickr user wisze. A local fencing coach, I learned yesterday, keeps an eye out for kids with a lot of potential. 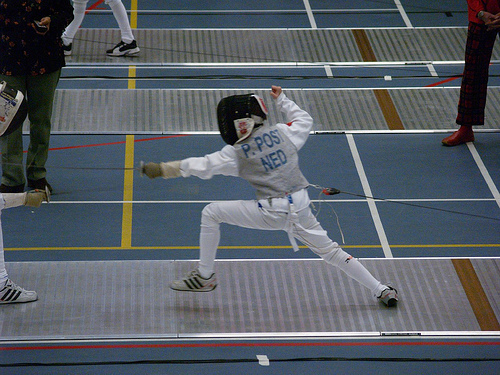 He assists their parents in finding good tournaments, helps them imagine what it might be like to attend college on a fencing scholarship (starting with, I presume, pointing out that such a thing is possible in the first place), and makes sure to introduce them to people that might be useful down the line (like the people associated with the colleges that offer those scholarships). It seems so obvious and so natural, yet in the nonprofit world it seems so rare. Executive directors that go out of their way to identify and then help cultivate the folks with the most potential are surprisingly difficult to find. It’s even tougher to find nonprofit folks that are looking out for high-potential newcomers across other organizations in their larger nonprofit community, and then making a point of giving them extra encouragement and support. It’s not the skill set, not really, because the skills themselves aren’t complicated: bringing your high-potential junior folks to higher-level meetings (even if all they do is listen), introducing them to important contacts and potential mentors, deliberately escalating their responsibilities, finding new ways to challenge them, ensuring that they are exposed to a wide range of strategies and styles and projects. It’s a lack of imagination, perhaps, or more likely a nonprofit culture blind spot. The bad news is that it leaves our bench thinner and weaker than it should be, and it puts people into positions of authority with a lot less experience and skill than they could or should have. I’ll bet we lose a lot of people, as well, who could grow into powerful advocates and champions but who bail early because they grow bored or frustrated with the lack of attention. The good news is that it’s not hard to fix.